A baseball field without a fence is like a swimming pool without water. It just doesn’t make sense. So if you are building a new baseball field or renovating an existing field, it is important to pay attention to fencing. Your outfield fence helps establish the boundaries of your playing field. How long is the field? Remember, chicks dig the long ball, as they say. And what is a home run without a fence? A lot of running…that’s what! Without a fence, how do you know what is in play and out of play? It begins to get a little ambiguous, which leads to arguments. And we have enough to argue with umpire over as it is. When it comes to the choosing the right fence for your baseball field, durability is the name of the game. Just think about the constant beating these fences take game after game, day after day: foul balls, players climbing the fence to try and make a play, and batting practice. Oh batting practice! Youth baseball and softball players love soft toss, throwing the ball in the air and hitting it against the fence. While this might be great in terms of developing proper swing mechanics, it can wreak havoc on a fence. 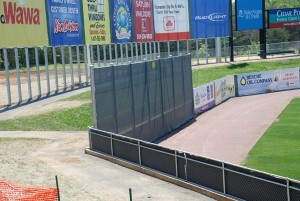 This is why we recommend Vinyl Coated Chain Link (of course, traditional chain link is also an option). While it may cost a fraction more than traditional Chain Link, vinyl coated chain link is still a very cost effective option. It is also incredibly durable and aesthetically appealing. That is what we like to call a win-win! If you would like to learn more about the right fence for your baseball field, please contact Hercules Fence of Northern Virginia today! A trained commercial salesperson can explain what product is right for your needs and budget. We pride ourselves in installing high quality fences at affordable prices. If you have any questions about Baseball Field Fencing, please contact Hercules Fence, the largest residential fence company in Northern Virginia, by calling (703) 551-2609 or visiting our website. Also, check out Hercules Fence of Manassas on Facebook, Twitter, Google+ and YouTube! This entry was posted on Wednesday, July 16th, 2014 at 2:25 pm. Both comments and pings are currently closed.